The Fairy Realm (or Marerijk in Dutch) is the oldest part of the Efteling. 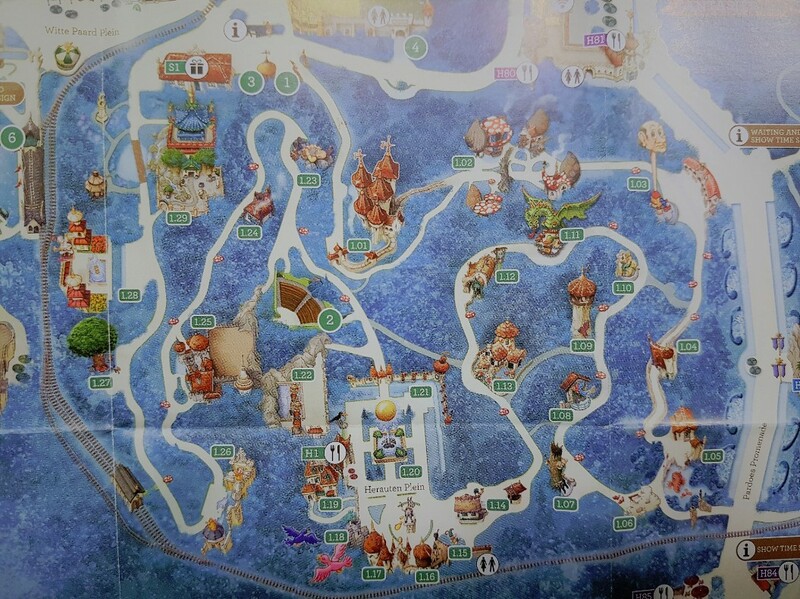 It was the 1st and foremost part of The Efteling according to The Wandelgek, because it contains almost all of the favorite places from which some were already there when he was still a wee little lad. Travelling through the Efteling means travelling with some of the most phantastic means of transport through a world full of ancient legends, sagas, myths and of course fairy tales. The 1st and also the number one place to start an Efteling adventure should therefore be a hike through Fairy Tale Forest. Fairy Tale Forest is foremost a beautiful forest, full of beautiful trees, ponds, animals and birds, but also full of magic. Walking through the forest you’ll find new magical adventure around every corner and behind which every tree. Is that a tower you just saw far away between the trees or is it the shards of mist playing with your mind? For every journey in such a wild forest you do need a good detailed map. Follow the route The Wandelgek took starting at 1.01, 1.02, 1.03… until 1.29 and discover the wonderful stories collected by the Grimm brothers or written by Charles Perrault or Hans Christian Andersen. Sometimes you’ll even find a completely new gem between these stories. Enjoy following The Wandelgek on his magical forest walk by clicking the numbers in the blog menu on the right.